The west side of 6th Avenue between West 48th between West 48th and west 51st Streets is home to 4 gargantuan office buildings, each with a building number ending in “1”: 1211 (the home of Fox News and the NY Post, where I helped out doing freelance work in 2005), 1221, 1251 and 1271. 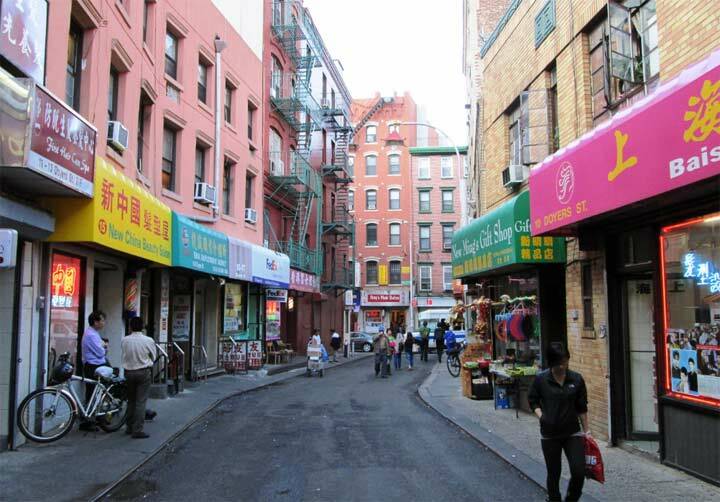 Each building has a large pedestrian plaza in front of it, accommodating throngs that are visiting Rockefeller Center and Radio City Music Hall, which face the east side of 6th Avenue. In the 1980s or perhaps earlier, the Department of Transportation devised a novel way to illuminate the plazas: take a regulation octagonal NYC streetlamp pole and outfit it with not 1, not 2, but 3 Cobra Neck masts. The cobras had been used on lampposts as early as 1960 — then, most of them were used to replace older curved masts with brackets. 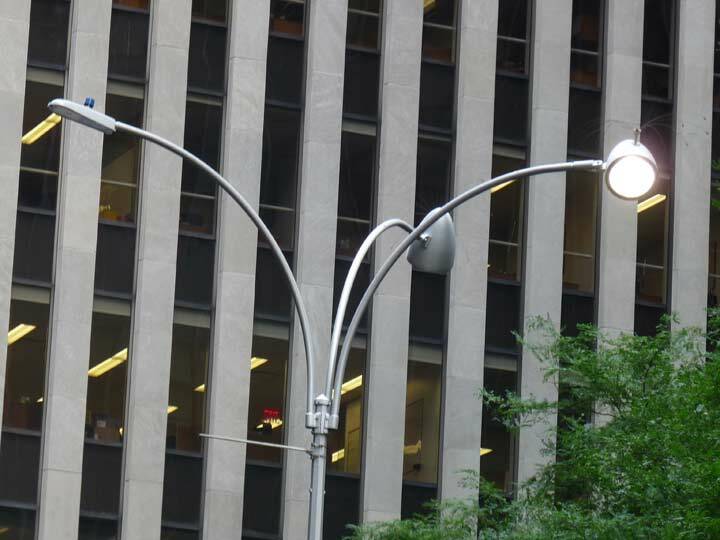 Beginning in 1968 on 6th Avenue — and that may be when this style originated — the first sodium vapor lamps were used on 6th Avenue on cobra necks installed on taller poles for the first time. 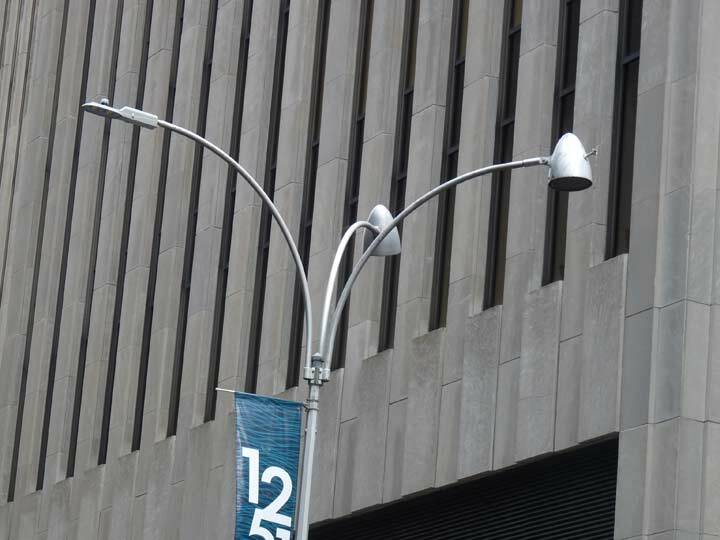 The luminaires used on these posts are also novel and are used nowhere else in NYC; I don’t know the manufacturer, but I informally call them the Cones. 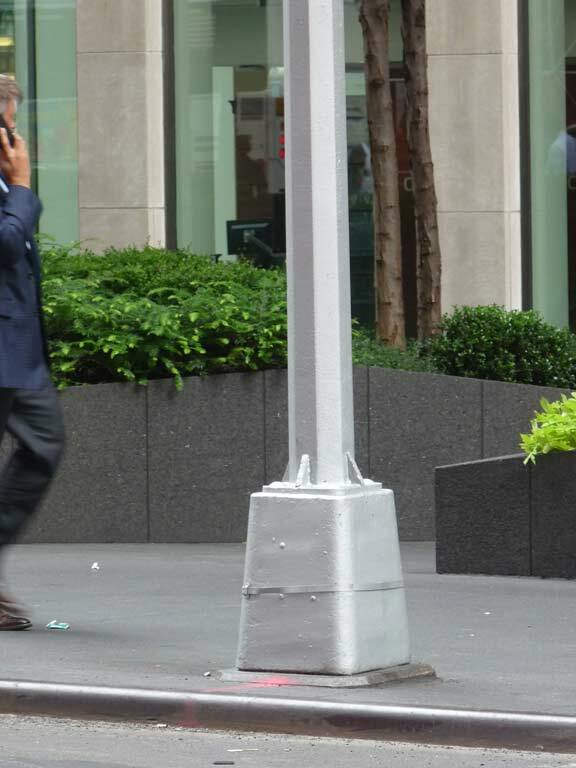 They illuminate 6th Avenue sidewalks on the west side of the street, but are also deployed, in pairs, on sidewalks on both sides of West 48th through 51st halfway down the blocks between 6th and 7th Avenues. As far as the lamps illuminating the roadbed go, they were sodium vapor until recently when most were given LEDs, but sodiums persist on one or two poles. And, on 6th Avenue, detachable straight masts are used; they are removed during parades such as the Macy’s Thanksgiving Day extravaganza. There’s one more minor difference in these Midtown Triplets. They have four small brackets where the base meets the shaft. Perhaps they are necessary as counterweights, as no other NYC straight masts use three masts. They’re the Ghidras on New York City! Not sure why the DOT changed the roadbeds to LED’s. They don’t own the lights. When the DOT changed all lights to 150 high pressure sodium around 2009, they left those alone. They still had some 1970’s GE’s, some Thomas and Bett’s models, a few Crouse Hinds models and some Cooper’s.